For 60 years, boot-maker John Hockney made and mended boots and shoes for the people of Willunga. He was born at Willunga in 1866 to Robert and Margaret Hockney, who had arrived from Lincolnshire in 1850 with four-year old daughter Elizabeth and settled in Willunga where Robert worked as an agricultural labourer for Thomas Atkinson. Robert won a silver medal for ploughing in 1856. Their daughter Elizabeth (John’s older sister) who was described as ‘deaf and dumb’, lived all her life in Willunga, became an expert with the crochet needle and later, in 1938, was said to be the oldest overseas born resident in Willunga. It is reported that John Hockney moved to Meadows when he was about five (circumstances unknown). He learnt the trade of boot-making from Mr. T. B. Brooks. He spent six months at Ellis Brothers and in 1896 returned to Willunga, aged 19, to take over the established boot-making business of John Richards Junior who had recently died. For the next 60 years John Hockney worked in his small (15 feet by 13 feet) rented boot-maker's room at the side of the general store at 22 High Street, assisted by Ted Elliott. A child in the early 1920s was fascinated with the boot-maker’s shop and its interesting role in the community. John Hockney, his wife Sophia (nee Brown) and their five children (Olive, Cyril, Eric, Nellie and Doreen) lived across the road at 13 High Street. It became a substantial home with lounge, dining room, kitchen, three bedrooms plus 2 smaller outside bedrooms, an outside wash-house and bathroom, a cellar, well, slate water tanks, a large garden with fruit trees and a small paddock for the horse. John involved himself in community affairs. He was at times captain, secretary or treasurer (in 1888) of the Willunga Cricket Club, a foundation member and president (in 1938) of the Willunga Bowling Club, auditor for the District Council of Willunga from 1898 - 1928, and a member of the Willunga District Schools Board of Advice in 1899. Sophia Hockney was also involved in community activities, notably as a member of the Willlunga Cheer-Up society during World War I. She was Church organist at the Methodist Church for 24 years and leader of the morning choir for 22 years. John was Church Trustee and a local preacher, known by the congregation as “Oft-Times” for his tendency to include in his sermons the phrase “Oft times as I sit at my work”. John Hockey died in Willunga in 1945 aged 79. Sophia Hockney died five years later in 1949. Dunstan Willunga town and district 1837-1900 page 12. 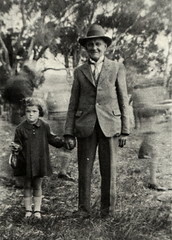 Boot-maker John Hockney, with his niece Rae Martin, courtesy of Martin Dunstan. Do you remember Hockney, John Edward ? Then Join up and add your memory here.